Temperature: below 20℃ (min) to 30℃ (max). Complete Rest in Leh for acclimatization and Evening hang around main market and Shanti Stupa. Visit to various monasteries like Shey ,Thiksey Hemis monasteries, over night in Hotel. Drive to chilling in taxi on the way visit of Phyang gonpa and offer prayer to start with visit of chilling famous for traditional handicraft. On this day here we start our chadar trek, virtually after breakfast start walking with day pack. Lunch stop overat tilat sumdo, the confluence of chharap river. 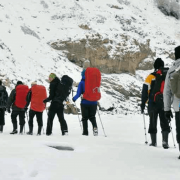 After the lunch walk till to camp, where parties have already busy with salting up of the camp near the small cave, this day you will experience we the different of the chard trek and the normal trek. Today we will come across a waterfall called chhumchar, coming out of rock. Here we assemble for lunch stop over may see wildlife in herd of groups. Here we will camp in a natural cave. Which can be accommodation more then 40 peoples, the biggest one on way in chadar caves. Today we come across a juniper tree before Nyrak villages. 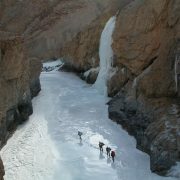 After short walk from juniper tree one most beautiful ice fall which is quite picturesque. In this area we see nyrak village’s upper top of camp and across bridge. Which made local wood over night camp Nyrak pullo. 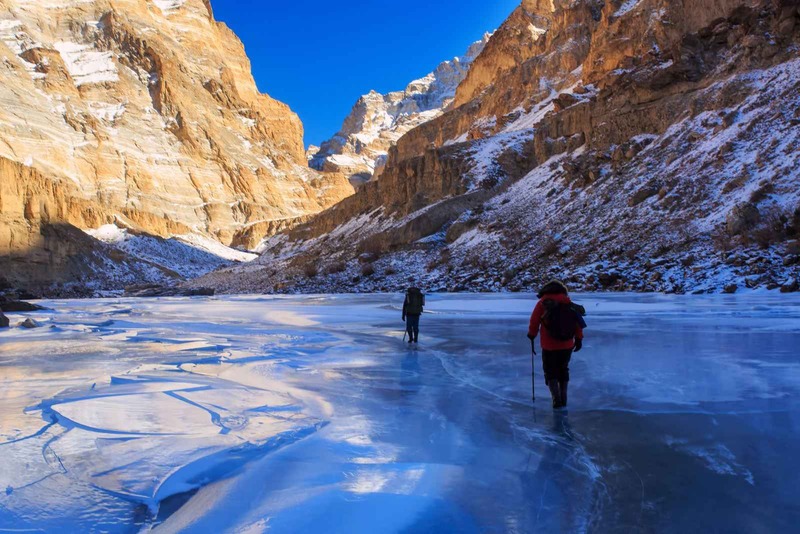 Morning after the breakfast walk along Zanskar River till lingshedsumdo, from lingshed sumdo we leave zanskar river chadar ice route enter in the lingshed Nalla, lunch stop and walk till lingshed villages from the villages very nice view of gonpa. Which is famous in the area for panting as well. Over night in the local family house. Morning after the breaks fast visit the monasteries at the top of the villages. 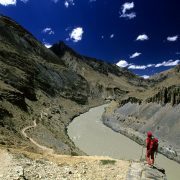 And we walk base down to the river bank side, lingshed do keep continue on the chadar trek. Here lunch near lingshed sumdo over night camp on sand beach at Hamlung. 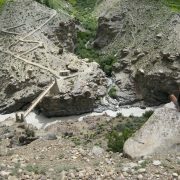 Today we come across a under river spring, which is supposed to be one in heddle in chadar trek, here the river appeases some time , then one has to take. Peoples ask whether there the ice some time softer its hold and water appear on the ice over night in local family house. The first village’s zanskar on the chadar trek route. We are in zanskar valley now further here we either take the land route or the river route. The area remain mostly remain cover with heavy snow so take the guided route only. Over night family local house. Morning after breakfast proceed towards karsha in the left. We will see Zangla palace and villages where royal family still resident and we pass small villages Rinam, stop for lunch on arrival at Karsha we explore the area, as we are in the main town and on the other side of the river we can see Padum two night in local house in Karsha. Morning after the break fast visit the Karsha monasteries and after noon free for personal activities, Over night in local house in Karsha. 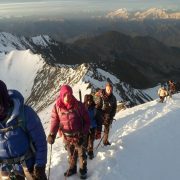 This is the day of return journey we proceed towards via pipiting guru visit, after lunch trek to tongday. Over night in local family house there we can visit tongday gonpa. This day we will be again in chadar after Pidmo village. On the chadar trek return journey till chilling by the some route skipping as we are trekking down words it will hers time to get campsite. After breakfast continue trek to Nyrak Pullo. Dinner and overnight stay in cave. Today we will trek up to chilling and from here return back to Leh by jeep. Free for the personal activity and shopping, Over night at Hotel. Morning transfers to airport and with sweet memory of ladakh.